The World Cup Game is a football (soccer) game that is like no other soccer game. This is the first of its kind that closely resembles the current genre of German-style boardgames that have become so popular in recent years. 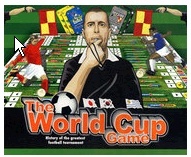 It is not a quiz game and it is not a single match style soccer game, but it covers two complete tournaments - the 1930 tournament in Uruguay and the 2002 tournament in Korea and Japan. Two games in one box. The 1930 game takes around an hour to play, while the 2002 game takes around 3 hours to play. The box is weighty, coming in at just under 2kg, so you get a lot for your money. The components are 2 large boards, 74 National flag tiles, 182 Action tiles, 87 Action cards, 36 Plastic footballs, 4 'blob'dice, 3 score sheets, a rulebook and the box! Includes score sheets and a game board for the 2010 game.